I read this one slowly because I wanted to understand everything that the author went through; holy cannoli — this organization and all of their regulations and levels. Oy! Ridiculous. 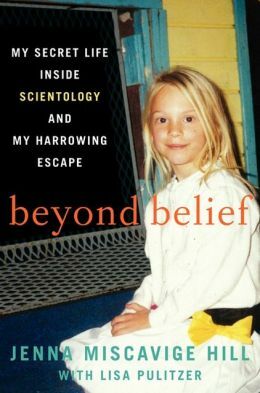 Who doesn’t want to hear the perspective of someone who grew up in the Church of Scientology? There’s so little truly known about the organization that I found it fascinating. Alas, I am clearly not a good fit for Scientology. The various levels and courses and tests and auditing and all of that stuff bored me to tears. Page upon page of courses and acronyms; too much. The book could have been a bit shorter. I was completely enthralled in the beginning; in shock, really. Then the shock gave way to monotony. The completely controlled life the author lived was just insane and relentlessly boring. But, it’s reality. What an awful reality. Obviously, from the title you know she got out of the organization. Thank God. It’s a wonder she’s able to function. So much to un-learn. All I have to say is good for Katie Holmes, I’m glad she got out. I worry for Suri. And I will never say a cross word about Nicole Kidman again. Ever. « A post you will not care about at all. This fascinates me.I saw a Dateline special, I think, on some people who got out of Scientology. It was really interesting and scary what is required of them and what they believe and what they sacrifice to leave if they still have family in there.eeek, not really sure what to make of it all.